Thanks for stopping by! Today The Play Date Cafe has another wonderful Color Challenge. This week I also used Julie's words as inspiration along with the colors she picked. I thought the newly released SteamPunk plate from Artistic Outpost would be pefect for this weeks challenge. When the boys were little and we'd take trips, it would never fail, we would hear "are we there yet"? One time as soon as we got on the road, my oldest says with a straight face "Dad, are we there yet", waited a minute or two, then said, "just kidding". 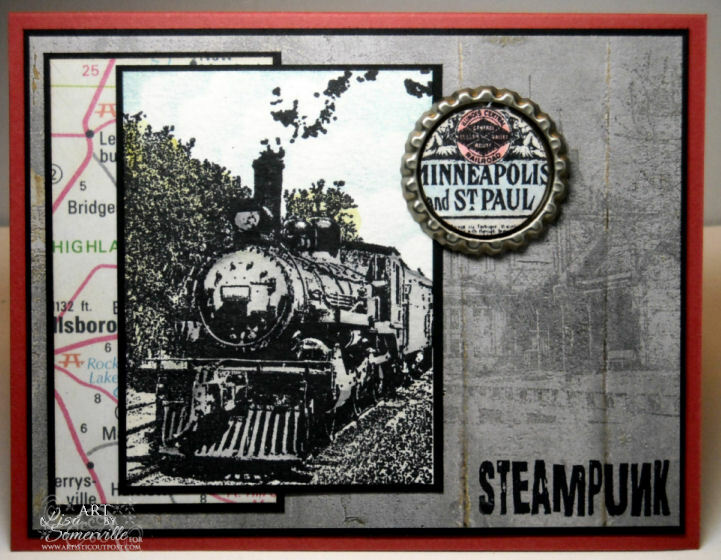 I stamped the Train Station image in Sahara Sand on the background paper, layered on a Black panel then onto the Ruby Base card. I aged the Map panel with Ranger Old Paper Distress Ink, layered on Black panel then to the base card. The Train image is stamped in Black Archival on Watercolor Paper, colored using a combination of the Marker Watercoloring Technique, and coloring with Distress Inks. I used a punched out Scallop, sponge dauber and Brocade Blue ink to create clouds in the sky. Using the Bottle Cap Technique, I stamped my sentiment, added color then adhered it to a flattened Bottlecap. The Big Shot works wonderfully for flatening bottlecaps! Had I been thinking ahead when I created this card, I would have added Ice Resin to fill in the Bottlecap - I added that after I took the photo, as I didn't have time to let it dry before my project was due. The Bottlecap is adhered to the card with Dimensionals. The sentiment is from this same plate, stamped in Black Archival. 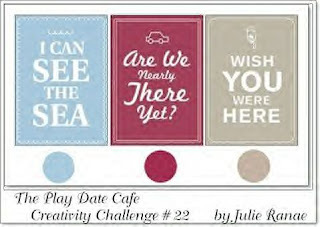 Looking for more inspiration using this weeks Play Date Cafe Colors? Click the PDCC Logo on my sidebar to visit the other designers blogs. I LoVe me some Steampunk and this set is a great choice! Beautiful work with the colors, Lisa! Love this vintage card!! The subtle stamping on the background paper is gorgeous, and the use of that map is brilliant. Thanks for sharing your step-by-step, too! Lisa this is fab! I love how you've done the background of the station, it's so effective and the splash of colour with the maps. I am really into the distressing right now, so loving that whole look. Obviously I'm loving the name of your red card too!! ;o) I'm not sure any red could have a better name! I really enjoyed reading about your bottlecap too, it's not something I've ever done, but I will have to try now. Are they special bottlecaps for cardmaking? Great challenge! The slight image showing of the train station in the bg is a great affect! Wow Lisa, this is really a amazing card. I love the old distressed look, the image and how you used it! Wow! Wonderful, Lisa!! Love that stamp and your use of the bottle cap is so amazing and creative!! Cool card, Lisa! I'm always a big fan of anything Steampunk! Great job! Thanks for the tip on the bottle cap. What a gorgeous card Lisa! Love that vintage steam engine! Awesome showing of this week's colors at the PDCC! Very pretty card-love these colors. I LOVE how you aged this! The look is just so FANTASTIC!!!! This is a really awsome card! Love that stamp!